Well, one could ask whether social justice issues are appropriately addressed in an illustrated children’s book. My answer after reading this biography of Justice Ruth Bader Ginsburg is, why not? A child of seven or eight is not too young to consider questions of equality. A child of nine, ten or eleven is not too old to enjoy a book with illustrations, when it is filled with great information. So in my view, this very appealing illustrated children’s book is perfect. It’s perfect because it can spark important conversations. And in today’s world, important conversations must begin in the family. What does equality look like? What does it mean to disagree without being disagreeable? What are the ways in a democratic society that we can work with injustice without resorting to violence? I admit for a while I’ve held the idea that young children (under the age of 8) should be left in a more dreamy, protected world of fairies and elves. And yet, an honest biography of an important living figure is equally essential. Many fairy and elf stories portray standing up for goodness. Why not look at real people who do the same? If this review of a children’s book sounds like I am defending myself against criticism, it’s just because I’m arguing with myself! I wondered and wondered about this book. But when I read it, and loved it so much, I realized it’s time to be bigger than concepts. 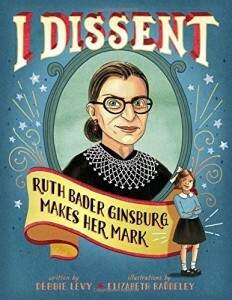 I hope many families get to enjoy the story in this children’s book about Justice Ginsburg. And may she continue to live a long and healthy life of service.